Duchess Kate: William and Kate Enjoy Pub Supper with the Middletons, Hobbs' Autumn/Winter Styles & A Royal Rewind! 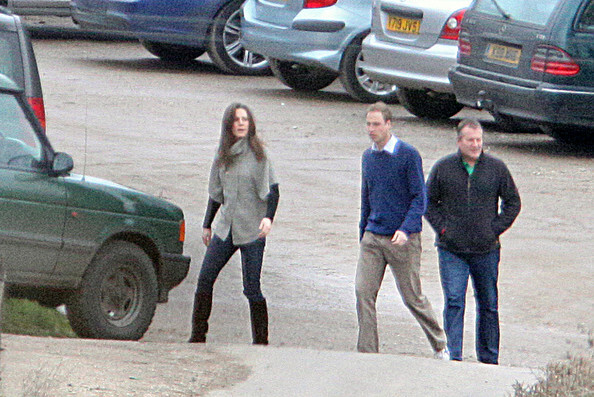 William and Kate Enjoy Pub Supper with the Middletons, Hobbs' Autumn/Winter Styles & A Royal Rewind! The Duke and Duchess of Cambridge have been keeping an incredibly low profile this month. It is believed they have been spending much of their time overseeing the finishing touches to their Georgian country home, Anmer Hall in Norfolk, before Prince William begins training for his new role as an air ambulance pilot in the autumn. It has been widely reported they plan to take Prince George to Balmoral where they will have the opportunity to spend time with the Royal Family and enjoy the Scottish countryside. However, it does appear they've spent at least the earlier part of this month in Berkshire with the Middletons. There were a couple of sightings of Kate in various shops in Berkshire and earlier this month the Cambridges and the Middletons enjoyed a family meal at their local pub, The Pot Kiln, located just three miles from the Middletons' manor in Bucklebury. An onlooker was surprised to see William and Kate arrive at the pub accompanied by Mike, Carole, Pippa and her boyfriend Nico Jackson. The group looked casual and relaxed in shirts and jeans as they enjoyed an evening without interruption. 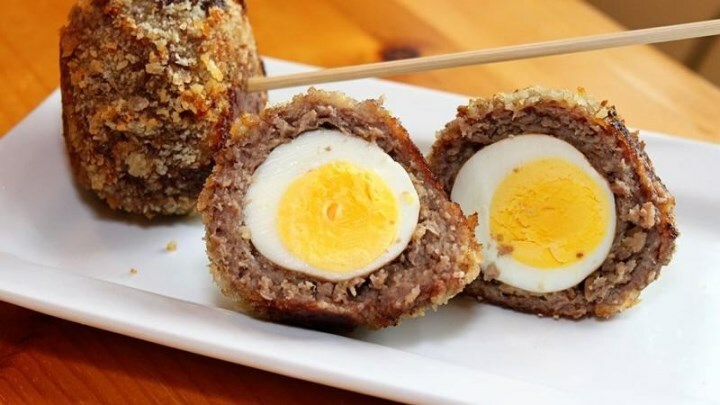 Kate and Pippa tucked into Scotch eggs; the traditional snack consists of hard-boiled egg wrapped in a thick layer of sausage meat with a breadcrumb crust. The Pot Kiln is the sort of rural pub William and Kate love. In fact, for Valentine's weekend 2010 they popped in for a bite to eat and had drinks. During their time in Anglesey too, they frequented local pubs, though in London they prefer to entertain at home rather than sampling Michelin-starred eateries. The view from the front door is beautiful. 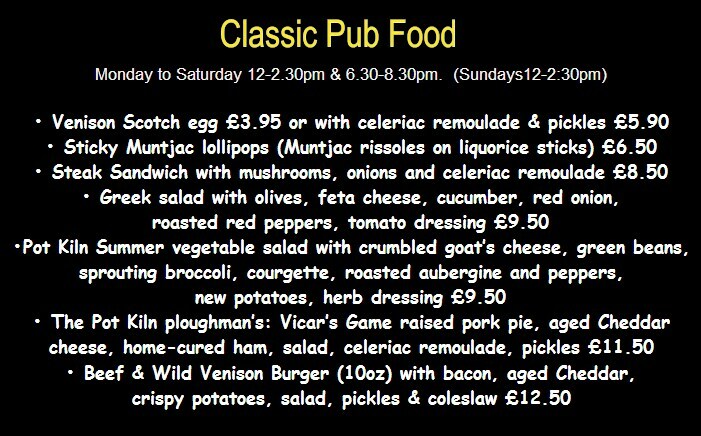 The bar food menu offers hearty classics including steak sandwiches, pies and Kate and Pippa's favourite scotch eggs. At present there haven't been any engagements announced for the Duchess. If nothing is announced next week, it would seem there wont be much in the way of appearances until Kate's solo trip to Malta on 20th September. Our next topic involves the Autumn/Winter Collection from one of Kate's favourite high street retailers Hobbs. We've been increasingly impressed with their offerings of late; sophisticated, chic, classic pieces which work particularly well for professional and formal settings. 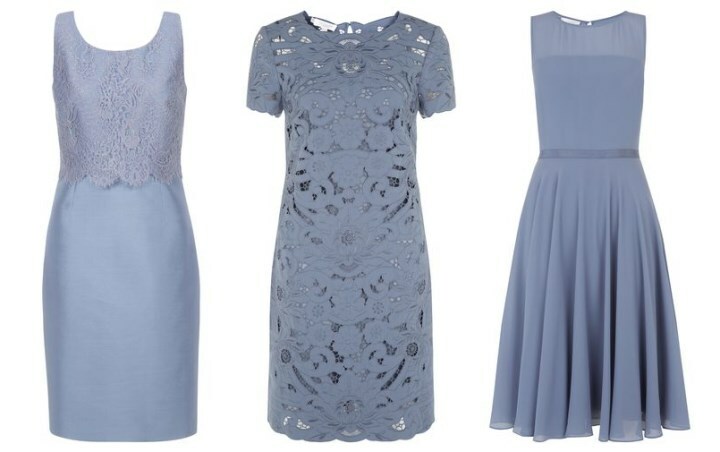 We know Kate loves blue and there are some gorgeous blue garments which would look perfect with a fitted blazer. What do you think of the romantic lace work on the Delphinium Dress, the Madeira Dress and the fit-and-flare Abigail Dress. 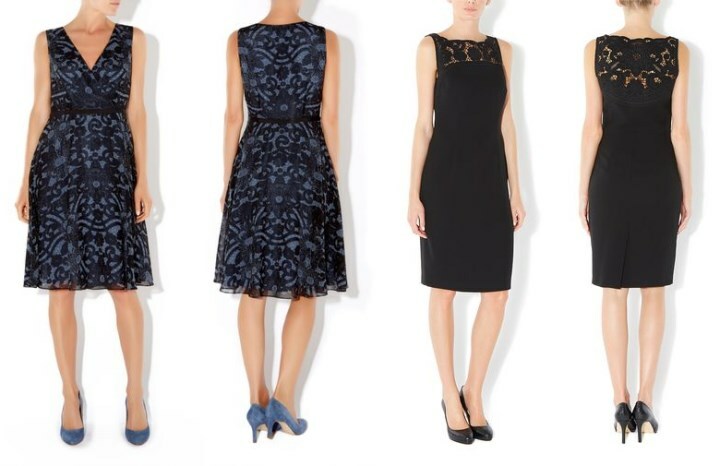 The ladylike Luisa and Anita dresses. A smart skirt suit or a pretty dress with a matching jacket also makes a good style statement. 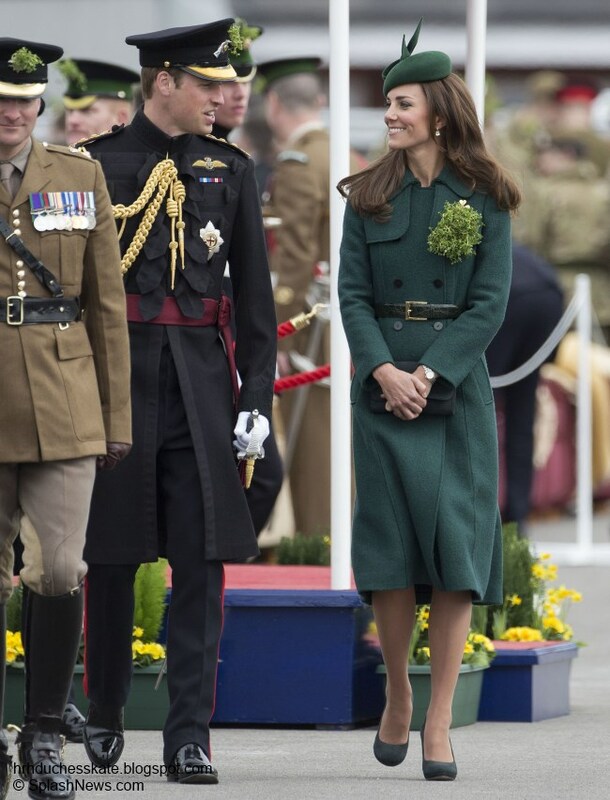 The Duchess would look great in the Eaton Jacket and Dress. We also look at the collarless Martha Jacket with matching pencil skirt. Red is a colour which works very well for Kate and it's a hue we'll be seeing plenty of for the coming season. Below we see the Etoile Dress, the Brunswick Dress and two rose printed frocks. The £349 Hampton Coat is part of the brand's forthcoming collection with Historic Royal Palaces, a collection that's rich in opulent textures and winter hues. 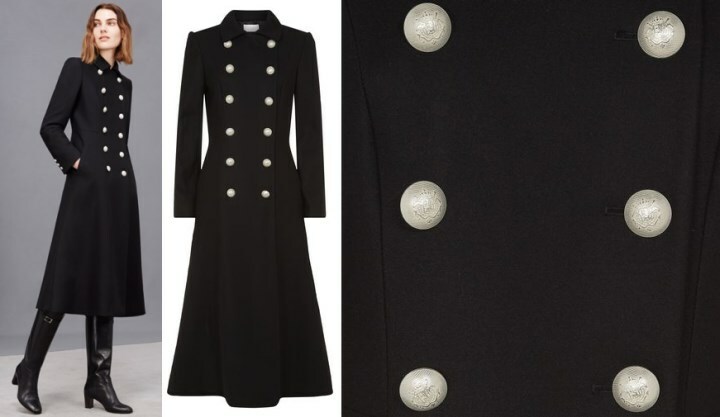 There's so much to like about this coat in the double-breasted military buttons, full-length drape and flared, feminine shape. It is very Kate. Fans of Hobbs will be pleased to see similar pieces from the brand arriving in the coming weeks. With another winning collection we expect to see Kate wearing their pieces again this year. Our other fashion update today concerns the Beulah London 'Eden' Scarf Kate wore at a rugby match during the royal tour in April. The cashmere blend scarf with fractured blossom print is reduced from £125 to £95 for the remainder of this week. Finally today we have a new feature to share with you, which we hope you will enjoy. Many of you will be familiar with the popular 'Throwback Thursday' craze which has hit social media. Readers have suggested it as a possibility for this blog and I thought it fun to take a look back at old candids or events at the end of a news post such as this every week or two. For our first 'Royal Rewind' we thank Ashley for sharing this previously unseen candid of Kate arriving at the McQueen studios accompanied be her protection officer Emma Probert. Kate is casually dressed in a white top, oatmeal cardigan, jeans and carrying her Mulberry Polly Push Lock Bag. One imagines it may have been one of Kate's last meetings with Sarah Burton before the royal wedding; even the last fitting perhaps? It was such an exciting time, although April 2011 now seems like a very long time ago! When the Cambridges visit Balmoral (if they are not already there) it is quite possible we'll see photos from a church service as we did last year. Thanks Charlotte for the pust! I made scotch eggs for a Christmas Eve treat one year (along with authentic sugar plums) - as a way to explore other cultures. Quite fun - very tasty - a bit on the "heavy" side - but what would you expect with sausage wrapped around an egg? Will have to try figgy pudding this year. Moxie, the sugar plums sound very inviting, were they hard to make? And I know I'm going to sound ignorant here, but what is figgy pudding? Is it made with figs, as it sounds? Moxie-- since I've discovered so many different recipes for sugarplums-- I've started to collect them! HiRoyalfan--I think I read somewhere a long time ago-- that there are actually no figs in figgy pudding---I think! I found the recipe I used for Sugarplums in a modern hostessing book - I'd have to dig it out - but here is something similar: http://sharedappetite.com/recipes/say-yum-to-sugar-plums/ My recipe used apricot preserves as well as dried orange peel. The recipe I had was not difficult - the challenge (and fun) was in locating the various ingredients. Dried fruits are not mainstream here - you have to go to gourmet shops and pay a premium for them (thus, these really are a treat.) If you look at 16th century recipes - the boiling process they refer to is actually modern day preserve/jam making - so you simply use preserves. This makes modern sugarplums no bake. I've not delved into figgy pudding recipes yet - but if any readers have any suggestions - let us know. Maryland Moxie, thank you for all the great information :) I think I'll start with the Scotch eggs. I have a question for the posters from britain. What are some typical items you cook for christmas? I don't eat lamb or goose. This will be my third year cooking christmas dinner and I have yet to find tasty items. So this year I want to add some british tradition to my table. Scotch eggs would be a great appetizer. But what are some items u usually have? Moxie- Thank you ever so much for the information. You know, I had completely forgotten about that line in "We wish you a Merry Christmas". When I was reading your comment (singing it to myself lol), it came back to me. To think, all these years I have been singing that, and I apparently never really listened to the words :). So, originally it was sweetened with figs (makes sense), and now we can you sugar if desired. Again, thank you, very interesting indeed. My mom has a cookbook of 16th and 17th century receipes, it is intriguing just to read it, I will have to ask her to email a figgy pudding receipe. I will definetly share it here when I get it, if anyone is interested. And thank you for the link, I will check it out post haste ;). Jo- have you found a sugarplum recipe you enjoy more than others? Thank you Royalfan, for the article, very interesting. And its making me hungry too ;). actually! I've got a few recipes, but have never actually made any of them! Moxie's with the apricot jam sounds better than mine!! Someday, I'll gather all of them and give an assortment of sugarplums to friends as gifts! 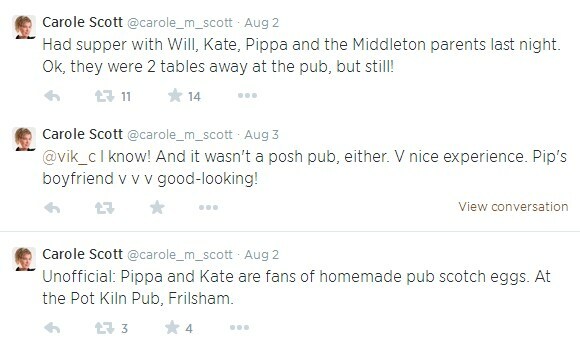 Charlotte, this is an absolutely delightful post :) Hope some day I can't visit a lovely Pub such as the one posted. The clothes, dresses, coats, etc... are lovely but, the blue lace dresses are my favorites. Best wishes to the Cambridge's for a wonderful time with family at Balmoral. I've visited The Pot Kiln and it is so wonderfully English! Bucklebury and the countryside surrounding where the Middletons live is so beautiful. Thank you very much Charlotte! What an interesting post! I agree with Sarah, I am partial to the blue lace dresses, especially the "abigail" dress, something about those flares. The black coat is lovely as well, but I'm undecided about all the buttons. They do look nice, but wondering if it would look to severe on Catherine, just mpo. I love the "throwback" picture as well. It certainly does look like she has some garment bag with her, though it looks far too small to be her wedding dress. As far as the scotch eggs recipe on the menu, maybe I'm mistaken, but doesn't it say Venison scotch eggs? Mmmm, that sounds better to me than mere sausage ;). Unless of course its venison sausage! Being from the mountains in NC, venison ranks before beef, in my book lol. My uncle has 17 deer heads mounted on his walls, and 3 of them were shot on his property (and yes, we eat everything we shoot, its not for sport, I don't believe in that), sorry I went off subject, but that made me hungry lol, and when I get hungry, I talk about food! Thank you again Charlotte....I love the fashion choices as well, they are beautiful to say the least. I should imagine it's venison sausage, sounds very tasty. If you're not keen to fry, they are very good baked as well. If your uncle comes through, sounds like you might have some cooking projects, Jenn- raised pie too, usually it's done with pork. You have to be a dab hand with pastry for that though. The fashions are lovely. The Hampton coat especially, wish I could justify it. Throw-back Tursday sounds like a fun chance to see things we may have missed. Oh wow Jenn, that is so interesting! I bet it tastes delicious to eat meat shot at your own property. My dad hit a pheasant (with his car...) once on his way home from the golf club. He made us laugh so much when he suggested we eat it. It was stiff as a piece of firewood, poor gorgeous bird. Off topic, but I too like to talk food when I am hungry, AND the venison scotch eggs on the menu sound very nice indeed! I would have thought the Middleton girls (sorry, duchess of Cambridge and her sister Pippa) would have preferred a salad, but there you go. Must be the protein they are going for! Loved that recipe Simone, thank you! If I lived anywhere near there, I would jet over in a jiffy, it sounds fabulous. Can't go past a good British pub meal! I think maybe the scotch eggs are very heavy on the oil, so I would try and share with somebody and have it with that delicious Summer salad. mmmmm nam nam!! There was a program about diners across the USA--one of them famous for its Scotch Eggs & showed soneone making one. The narrator said that it sounds terrible but is actually Very good! Jenn- I have friends who hunt a lot--they tried to sneak a venison burger at me-- but I could tell!! I guess you have to grow up eating it--tasted a bit "game-y" to me! Florence-hope I didnt leave you out--of my last postt!! Leo- My Uncle Jack has tons of ideas for his venison, he is just usually too busy to try any lol. I like the sound of the raised pie also (thank goodness my grandmother and mom taught me how to make pastry from scratch, comes in handy). I will have to check that out as well. Florence- Yes, his venison is so so tasty! And he has so much of it lol! Awww, that poor pheasant! Too bad it was tough. See, I get side tracked talking about food again lol. OOPS! !...one of my dearest & oldest friends for 40 years has Never been able to roll out a pie crust--and she makes wonderful pies! She has to squash pieces of dough together to create her piecrust! Jo from USA The name of the TV show is called Diners, Drive-ins and Dives. It is very popular. And a great show. Wish I had the time to get in an RV and travel across the US and visit all of them. He has written a book on all of them. I can't remembe the name. Jenn, I have 2 venison roasts in the freezer that I want to use for sausage and then Scotish eggs. Jo- lol, I am not surprised you were able to tell the difference. Yes, some venison can be "gamier" than others, depends on a lot of factors. So you didn't enjoy it? ;). Pauline- I love watching that show, it is so unique. I too wish I could just hop in an RV and visit all the places that the host/chef does. Sarah- Yum, venison roasts are so tasty. Especially if you let it simmer all day in a slow cooker, with onions, lil garlic, carrots and potatoes......ok Jenn, stop stop stop lol...I am getting carried away! Thanks Pauline! My post-menopausal memory does well generally, but fuzzy on the specifics--names, especially!! Jo, Jenn if you or anyone is still reading this, good venison sausage meat shouldn't be too gamey and Scotch eggs are best with well-seasoned sausage meat. It is also best to choose smallish eggs, pullet eggs if you can get them, since the sausage forms neater around smaller eggs. P.S. Anon 03:04- I am so jealous! The Pot Kiln looks so rustic and lovely! I bet you had a wonderful time. I would love to visit it someday! I found this interview of Duchess of Cornwall's daughter-in-law who was asked her opinion of Catherine, Duchess of Cambridge--read why she finds her endearing. That sleeveless black and red dress is standing out to me - the whole Hobbs collection is lovely. I like the cut of the coat - but I am tired of seeing military style buttoning. If we are bringing back elbow length gloves - lets bring back capes as well. Charlotte - when and where was that picture taken or Kate and Will that is credited to Baeur Griffin? Is that recent or on Angelsey? The red dresses are definitely my favorites - beautiful shade of red! Kate's Mulberry Polly Push Lock Bag is to die for! I wish I could afford it someday... Are there any similar bags to buy at the moment? Natalia, you reminded me of something I meant to ask. That bag/purse that Catherine is carrying (yes, I like it a lot also), I don't recall seeing her with a purse before, only clutches. Am I wrong or just not remembering her with any other purses? I just can't think of any other time I saw her with one. Maybe my brain just isn't working right now lol. Bluhare, I am curious, what do you think of this Mulberry bag? Personally, I think it becomes her. Jenn, handbags were staples for her before she got married and she still uses them when she is "off duty." I love the Hobbs green coat from above. It looks absolutely gorgeous on Catherine. Wish I was able to dine at the Pot Kiln......nice place. Last weekend before school starts and I've got a kid off to college.....the empty nest is beginning.....heavy sigh. Mel, I hope you are able to enjoy the weekend with your kids, before the empty nest starts! I have 3 of my own that have "flew the coup", I'm just thankful they are going to college fairly close (within an hour drive). But I know how you feel. Cheer up, it will get better! Thank you, Charlotte. 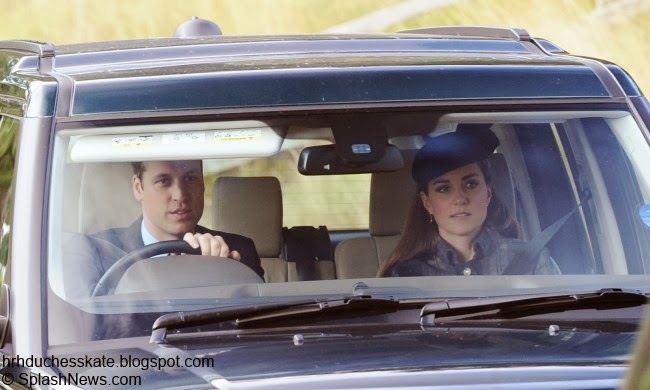 William and Catherine are again illustrating their love for the Middleton family and the British countryside. The pub looks like a very cozy spot. I especially like the grey tweed coat, and the dresses are beautiful. Kate would need a warmer shade of blue, but those dresses all would suit her admirably. I'm not sure about the pearl? buttons on the dark coat. They don't quite seem to go together. I don't think that this person likes the duchess very much at all. She does not say that the duchess has many important things to think about, but rather that "clearly, she feels" that she does. She also uses the term "endearing" to describe her "feelings" about this. That is, the duchess feels that she has important things to think about and that makes her endearing, not awe-inspiring or fabulous, but endearing. She is definitely patronising and even a tad bit sarcastic here, no doubt about that. Anyone else think the same ? No. She goes on to describe her mother, the duchess of cornwall, shopping style in the same manner. I too thought it was an odd quote that was just a shade off of being complimentary. I agree Anon from MO, it did sound that way to me also, not a tasteful comment from the Duchess of Cornwalls daughter-in-law, IMO. Anon from MO, the first thing that got my attention was the reference to the "past", as in there isn't much of a relationship to speak of in the present. The second thing is her similarity to her husband who also enjoys name dropping when he is interviewed. Lol. I don't know if she was snark or the quote just sounded that way in print. But I think it was weird she spoke at all in the first place. We all know the Queens stance on people talking about them, even when it's good. Can't see that stuff like this makes Camilla get into any favor with the queen. In my opinion, sometimes what is said and how it is phrased when written are quite different. However, because I was not there I will give the Duchess's daughter-in-law the benefit of the doubt. What I got from the quote as it concerns Catherine, Duchess of Cambridge, was that she was not a "a slave to fashion"--that her life is so busy that other things took precedence. Perhaps there was something about trying to stir up favor for Camilla. It would have been best on her part to have left out any discussion of Catherine. It was just an odd interview. Interesting observations Anon from MO. I hope you all have a sunny weekend! Absolutely delightful post, Charlotte! A nice break from all the bad news around the last few weeks. I had forgotten about those to-die-for green shoes she wore at the Shamrock day. I hope we see another appearance of them! I agree. A great selection of pieces that I would love to see Kate in! Thank you again for another nice post. With all the headlines so awful these days I cannot express how much it means to come onto this blog and have some cheerful and light news to read. Have a great weekend! Hobbs has a USA website with prices in dollars and presumably US sizes. Measurements, however, are metric. Many of these clothes look quite appropriate for business wear. I just read Kate's schedule for Malta on September 20 and 21. If this is accurate, she will be quite busy. I could not find it on the royal website. I got that backward! Sizes on Hobbs USA are British, body measurements are in inches. Looks like the Daily Mail have got the info on Kate's visit to Malta and detailed the itinerary for the 2 days. Thank you both for the web sites to Kate heading to Malta. Very interesting article and wow Kate will be attending 10 events. That will keep Charlotte very busy. Probably why I already see a new blog to get us ready for this 2 day event and when I jumped down to this section, there were 0 comments on Charlotte's new blog so far. I am saving her new post for another time period as something to look forward to. I so appreciate the links that so many of you submit. I have done so much reading since becoming a part of this blog community. 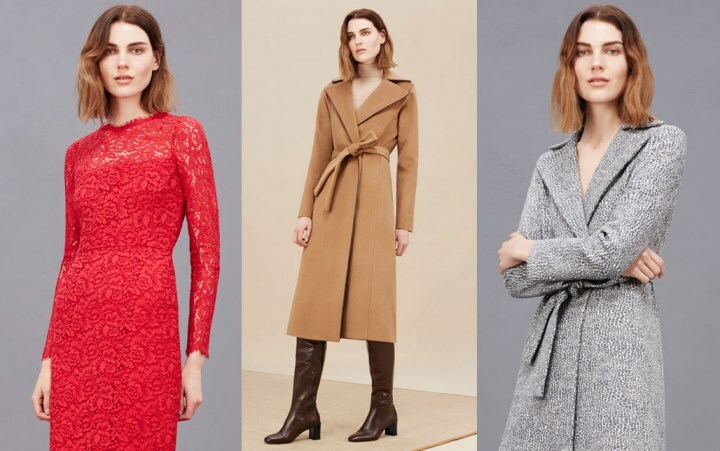 Lovely collection from Hobbs, certainly very Kate! For those with a more modest budget, H&M has a few nice jackets and shift dresses next season that are very Kate, in case you are interested in recreating some of Kates style! I don't think that Sara should have spoken about Kate in the 'Telegraph' interview. What she said is open to interpretation, and is very odd. I've had a quick look at the interview, and seen that she mentions that she had a 'quite a few panic attacks before the (wedding) day'. This annoyed me, somewhat. I sincerely doubt, from the way that she has said it, that she suffers from the (potentially) debilitating condition (which a close friend has); she has not used the term appropriately. Who's sitting next to Catherine in the rugby photo.